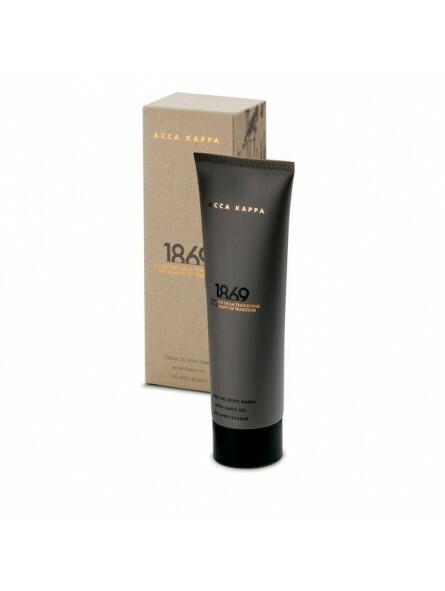 Acca Kappa 1869 Aftershave Gel 125ml. This after shave gel cream has been made with with sweet almond oil and cornstarch. Ideal for treating the skin, before and after shaving, making it smooth and even. 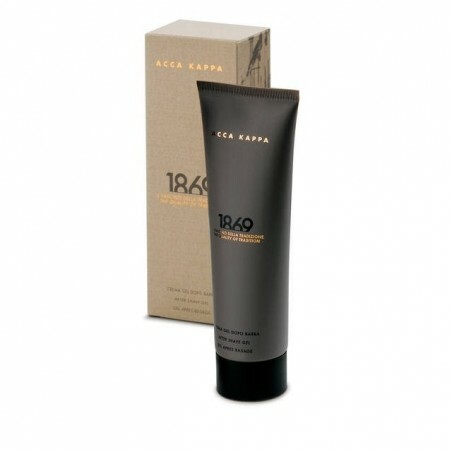 1869 gel cream is the result of thorough research into skin treatment formulations before and after shaving. Cornstarch has emollient properties and prepares the epidermis and the beard for shaving. Horse chestnut and liquorice extracts give the product marked soothing and cooling properties after shaving, while a particular and elective extract of the brewer's yeast is an excellent adjuvant in the regeneration of epidermal cells. Sweet almond oil and talcum powder leave the skin smooth and even. Vitamins A and E help to counteract aging of the skin. DIRECTIONS FOR USE; Moistened with warm water on soap, the shaving brush produces a creamy lather. When applied to the face in circular motions it softens the beard, opens the pores and facilitates the action of the blade, while at the same time massaging the skin.